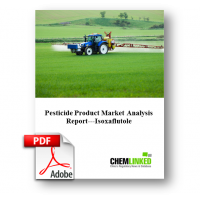 Isoxaflutole was first synthesized in 1990 and its herbicidal properties were recognized in 1991. The initial producer according to the EPA was Rhone-Poulenc Ag Company, which became Aventis CropScience and was then acquired by Bayer CropScience in 2001. Isoxaflutole is a pigment inhibitor. It works by preventing the biosynthesis of carotenoid pigments, which protect chlorophyll from decomposition by sunlight. Without carotenoid pigments, chlorophyll pigments are photo-oxidized and chloroplasts break down. Without the energy-collecting action of the chlorophyll, the whole plant eventually dies.